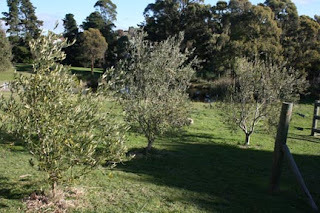 .......53 Buddhas and Me .................My Life Adventures.....: Olives !!!!!!! Tonight's post is a request of help from me to you. This beautiful property here in Daylesford has lots of trees and plants I will eventually be able to get food from. Me being a city girl, I know I am going to have to be a bit of googling to find out the what, when and where of what I have. Now as I don't eat olives this produce is an interesting challenge. I have three olive trees and the fruit have now turned dark so I am thinking it it time to harvest and actually do something with them. I am intending on marinating them (don't know how!!) and giving them to my family, who do eat them. That's where I need your help - what do I do with these Olives ?????? Are these ready to be picked???? Not sure but I love olives!! Be sure to let us know what you do with them! 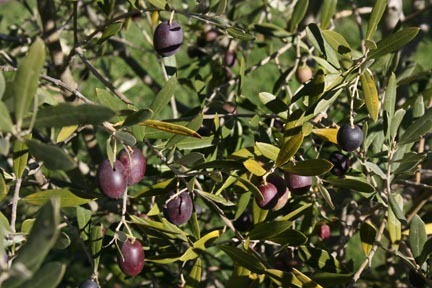 I have no idea but I've always wanted an olive tree since i LOVE them. Google is probably the best answer. I'll be watching to see what you find out. I have found a recipe on google so I will give that a try and then have to get someone to be by taster as I don't like olives at all.